Eye injuries and infections are common in horses. This is just one of the reasons you should check your horses —and not just from over the pasture fence — at least twice daily. With prompt treatment, many eye problems can be brought under control within a few days. Sometimes a veterinarian should check the eye, but most treatment can be done by you, at home. What Are Eye Infections in Horses? Common eye infections and injuries in horses include bacterial infections, contact with parasites, and physical wounds. Untreated eye problems can become nasty very quickly. Minor problems can even result in blindness if left untreated. If the eye becomes badly infected, the structures of the eye can be eroded until the entire eye collapses. Your horse's eyes should be clear, bright, and the lids tight, with the inside of the lid pale pink and moist. Tearing should be minimal with perhaps only a droplet at the corner of the eye. Sometimes, if there is dust, dry air or​ wind, a horse’s eye might run a bit, just as yours would. 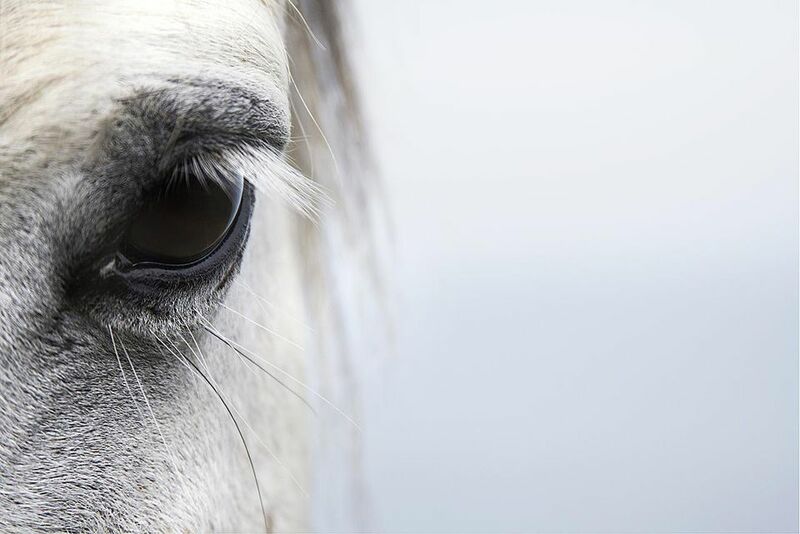 Just like humans, horses are prone to conjunctivitis, caused by irritation or bacteria getting in the eye. It presents in horses in a similar way: redness, swelling, and oozing pus. This infection requires treatment with an antibiotic, usually drops or an ointment applied to the eye. Recurring uveitis is another, much more serious eye infection in horses that can lead to blindness if left untreated. Also known as "moon blindness," this condition can be traced to two possible causes: infection with the Leptospirosis bacteria, or the Onchocerca cervicalis parasite. Most often in horses, Leptospirosis is the cause. The signs of uveitis include squinting (indicating sensitivity to light), cloudy eye, yellowing of the whites of the eye, chills, fever, lethargy, constricted pupils, and eye spasms. If you notice any of these in your horse, take it to the veterinarian immediately: Uveitis is fast-acting and requires aggressive, timely treatment with antibiotics. The parasite Thelazia spp. is the cause of a nasty condition known as eye worms. This condition is passed from one animal to another via flies, and is most prevalent in cattle. A veterinarian will have to remove the worms from the horse's eye with surgical instruments (usually a forceps) while the animal is under sedation. If your horse has an eye injury or infection, utilize your horse's first aid kit after alerting your veterinarian. You should have salt or saline solution in your kit. Clean the area very gently with a saline solution. If you don't have one on hand (like the saline solution for contact lens wearers) you can make some yourself. The ratio is about 1/4 tsp. of table salt to a cup of water that's been boiled and cooled to lukewarm. It should taste like tears. Put a fly mask on the horse to keep flies off of the eye area. If possible keep your horse in subdued light such as its stall until the veterinarian arrives. Rips and tears in the horse's eyelids should be attended to by a veterinarian so the lid can be stitched if necessary. The vet will also check for damage to the lens and anything that may be lodged in the eye (splinters, awns from grasses, or grit). A vet can assess the overall health of the eye and may be able to see problems that aren't apparent to the untrained eye. The veterinarian will probably give you an ointment or gel to apply to the eye. In some cases, he may draw a vial of the horse's blood and make a solution from it that you will irrigate the eye with. With all medications make sure that you follow the veterinarian's instructions to the letter and be scrupulously clean as you apply any dressings or ointments. Just because you see marked improvement within a few days, don't stop the medication until the full course is up. Stopping treatment before the infection or injury is completely healed can result in the infection flaring up again and possibly causing more damage. When working with a horse with an eye problem be aware that it may have obscured vision and be a little more jumpy than usual. Talk gently so you don't surprise your horse if you walk up on a "blind side." Your horse's environment should be as dust free as possible. If hay is dusty, or bedding is very dry and dusty, dampen it or use other fodder or bedding. Make sure that sharp edges on water troughs, metal buildings, pipes, or other obstacles are covered or inaccessible. Pound in or pull any old nails that may be protruding from fences or other structures. Many injuries are caused when horses are playing or scraping, and this is almost unavoidable. Just take care to make your horse's home as safe as possible.